1949 First prize and laureate at the First Bulgarian competition for violin making. 1957 Gold medal for sound, bronze for workmanship and diploma for excellence at the International competition for string quartets in Liege, Belgium. 1959 Silver medal (large version) for modern viola at the international festival in Ascolli Piceno, Italy. 1969 Grand prize of Sofia, Gold medal end laureate at the Second Bulgarian competition for violin making. 1972 Silver medal and laureate for workmanship and sound at the International competition for string quartets in Liege, Belgium (gold was not awarded). 1977 Finalist third round, laureate at the International competition Wieniawsky Poznan ? Poland. 1978 First prize and diploma for the finest workmanship at the festival in New Ark ? Great Britain. 1978 Diploma for the finest workmanship in San Diego, California. 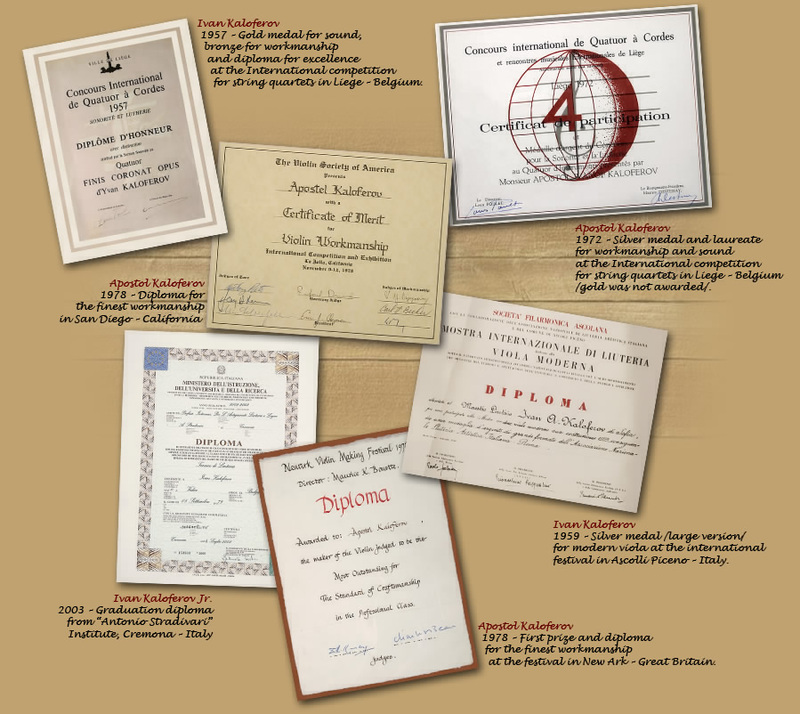 2003 Graduation diploma from Antonio Stradivari Institute, Cremona, Italy.